Posted by Justin Blaber on Sunday, July 31, 2011 in Neuroimaging. Mapping the quantitative relationship between structure and function in the human brain is an important and challenging problem. Numerous volumetric, surface, regions of interest and voxelwise image processing techniques have been developed to statistically assess potential correlations between imaging and non-imaging metrices. Recently, biological parametric mapping has extended the widely popular statistical parametric mapping approach to enable application of the general linear model to multiple image modalities (both for regressors and regressands) along with scalar valued observations. This approach offers great promise for direct, voxelwise assessment of structural and functional relationships with multiple imaging modalities. However, as presented, the biological parametric mapping approach is not robust to outliers and may lead to invalid inferences (e.g., artifactual low p-values) due to slight mis-registration or variation in anatomy between subjects. 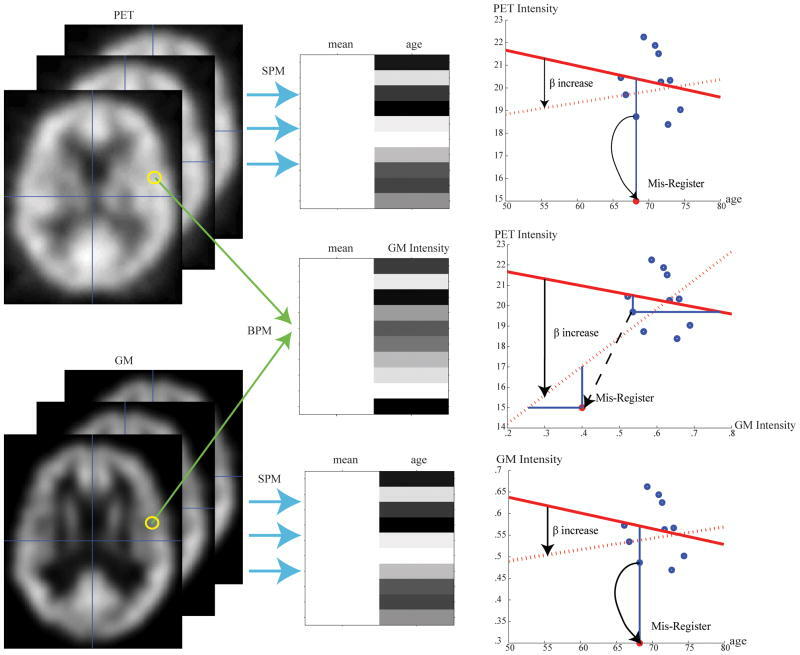 To enable widespread application of this approach, we introduce robust regression and non-parametric regression in the neuroimaging context of application of the general linear model. Through simulation and empirical studies, we demonstrate that our robust approach reduces sensitivity to outliers without substantial degradation in power. The robust approach and associated software package provide a reliable way to quantitatively assess voxelwise correlations between structural and functional neuroimaging modalities. Increased sensitivity to outliers with BPM. Considered a simple one regressor situation, model y = βx + μ is used to fit data points in voxel wise analysis. In SPM, the imaging data (left column) lies along the y axis. (i.e., imaging data is treated as y in the fitted model.) The left column shows two sets of images data, PET blood flow maps (top row) and gray matter (GM) tissue density maps (lower row). The middle column shows the design matrix for each regression. Considered one voxel within mis-registration region, in separated analyses of these datasets with SPM (top and lower rows), a mis-registration induced outlier impacts only on data point in the y-direction. In a joint analysis with BPM, the outlier impacts both the x-axis and y-axis, and can result in dramatically different model fits. In the simulation the true β is a small negative value, but the outliers increase the estimated value of β to make it approximately zero or even a large positive number.